"I'm Mary Poppins, y'all! "Once a Ravager, forever a Ravager. Yondu will always remain in our hearts. Years ago when Yondu were actively involved in child trafficking in Egos quest, Captain Stakar exiled him for violating the Ravager code. But after knowing the terrible fate the child will face, Yondu chose not to deliver Peter Quill (Star-Lord) to Ego and raised him instead; even sacrificed himself to save his beloved son Star-Lord. 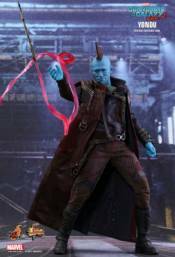 Today, Hot Toys is pleased to dedicate to Marvel fans the 1/6th scale Yondu collectible figure in memory of his selfless act and his loyalty as a Ravager from Guardians of the Galaxy Vol.2.Expertly crafted based on the image of Michael Rooker as Yondu in the well-reviewed blockbuster, the 1/6th scale Yondu collectible figure is just phenomenal, highlighting the remarkable likeness. The figure features a newly developed head sculpt, interchangeable magnetic fin and the new prototype fin, a intricately tailored and highly detailed costume, a pair of suspenders with arrow holster, a dagger attached to the wristband holster, a specially designed figure base, and a miniature Baby Groot attacking in his Ravagers outfit!